PLEASE HELP OUR FRIEND RICK. Seven years ago, Rick Cigile suffered a catastrophic accident while on vacation in Florida. While swimming in the ocean with his family, Rick was hit from behind by a rogue wave which drove him head first into a sand bar. 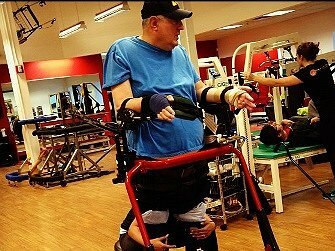 Rick suffered a C-4, C-5 incomplete spinal cord injury and as a result was paralyzed from the shoulders down. Soon after, Rick began a high intensity training program which has allowed him to regain physical functions and neuro-sensitivity from head to toe. Rick’s continued fight has resulted in improvement beyond what his doctors thought possible. The longer he continues with this physical and occupational therapy, the more movement and control he is regaining. Without this therapy Rick’s health would greatly diminish. We are confident that with the right care he can make even greater progress. 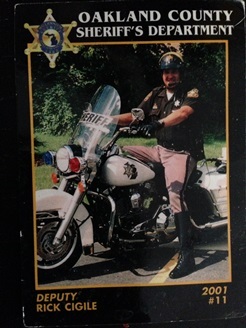 Before his accident, Rick was very active and worked as a deputy sheriff for the Oakland County Sheriff’s Department. Rick worked in many areas of law enforcement as a member of the motor unit, dive rescue team, tactical unit, and correction and road patrol services. He also had the distinguished honor of providing executive protection and motorcade duties for four US presidents, in addition to Pope Saint John Paul II during his visit to Southeast Michigan. In spite of the many struggles he faces, Rick remains positive that he will be able to return to a productive life in the community and perhaps someday resume coaching youth ice hockey. Rick has helped and affected the lives of countless people in a positive way. Even with insurance, Rick continues to have many uninsured injury-related expenses such as: co-pays and deductibles, doctor visits and the costly rehab therapy that is so beneficial to Rick’s overall outcome. Over time, these expenses will run into the hundreds of thousands of dollars. To help offset such expenses, a fundraising campaign in Rick’s honor has been established with HelpHOPELive, a trusted nonprofit organization that has been providing community-based fundraising guidance to patients and their families for more than 30 years. All donations are tax-deductible, are held by HelpHOPELive in the Great Lakes Spinal Cord Injury Fund, and are administered by HelpHOPELive for injury-related expenses only. If you would like to make a contribution please click the DONATE NOW button. Thank you in advance for your support of Rick – together we can make a difference! Hello Rick! At our last FOP meeting we voted to donate $100 to your recovery fund. Karen Codere passed the hat to those present and raised another $124 for your fund. You continue to be in our thoughts and prayers! Stay strong and continue the fight! God Bless you and your family!-Johnny O.
Rick sorry we were not able to make the fundraiser, but know you are in our prayers. Stay strong and keep fighting!! Best of luck to you Rick, keep fighting! Rick, We haven't spoke much since WSU. I am inspired (but not surprised) by your courage and success. God bless you and Patti. I am glad to help a great guy as he recovers from this accident. We know you can do it. Keep working, Rick. We love you! Rick, With your determination, and the support you have from family and friends, I'm sure you will be able to accomplish all you set out to do. Rick, look forward to seeing you again at the event. You're an inspiration to us all. You're a great guy and I know this even will make a difference. Rick, Any friend of Jeff's is a friend of ours! Keep getting stronger. We believe in the power of prayer and will be keeping you in our thoughts. keep the faith, Rick. Some day you will be coaching again. Rick, you are my Hero! God Bless You. Keep up the fight and the will to overcome. Praying for you! If anyone has the energy and heart to keep pushing, it's you!!! Rick -keep up the hard work! I don't know you Rick but just want to keep fighting brother. Will be sending prayers your way! To my dive partner and partner in crime with a bottle of papaya lotion, I think of you often. Fight the Fight, NEVER quit!